We collaborate with our medical advisory board to identify unmet needs of surgeons. In response to the needs of microsurgeons, Newmedical has developed the most innovative surgical hand table in the marketplace. The contour provides simple, integrated elbow and forearm support for both surgeon and assistant. This improves comfort, which can decrease tremors due to muscle fatigue. The infinite height adjustments allow improved access with operating microscopes. 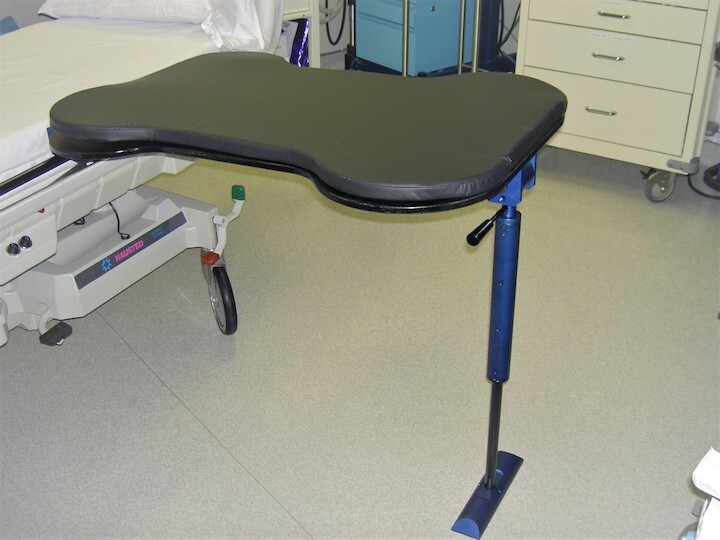 The single leg minimizes floor clutter and provides the rigid platform needed for microsurgical procedures. The unique design of the UniTable incorporates the most desirable features of other, more expensive hand tables and more. The unique state of the art pneumatic technology used in the UniTable single leg makes it the ONLY table that provides exceptionally smooth and precise height movement and adjustment. The ergonomically designed contour maximizes surgeon comfort and patient accessibility. The extended “shelf” allows room for instrument placement during procedures and access when a second assistant is required. The unique carbon fiber composite material tabletop has the ultimate, unobstructed radiolucency demanded by today’s surgeons. The single leg design allows maximum accessibility by conventional radiograph equipment and C-arms. The UniTable is particularly well suited for use with newer “mini C-arms”. The thin material minimizes the distance from patient to C-arm, essentially eliminating magnification problems. Convenience of handling, cleaning, storing and installing the UniTable are integral to the design. Universal brackets are supplied for use with both standard and metric side rails. The simple folding leg allows easy storage. The use of lightweight materials minimizes overall weight without sacrificing functionality and rigidity.